Home  My Gleanings Page  Illustrated Edition - Page 5. Illustrated Edition - Page 5. An Unprejudiced and Conservative Review of the Value of Our Hidden and Undeveloped Wealth. Iron, Coal, Lead, Spar, Zinc, Building Stone, Lime, Clays and Paints. Topography, Drainage, Soils[,] Geological Formations and Timbers. All That is Needed to Insure Prosperity is the Development of Crittenden's Natural Resources. As you will probably with to publish my letter, it may be well to say why I may be expected to know something of the county. In the fall of 1888 Prof. John R. Proctor, the accomplished Chief of the Geological Survey of the State, sent me to Western Kentucky to make a careful and systematic survey of the counties of Caldwell and Crittenden. A good part of the two years passed since that date were spent in field-work there, and though the region presented unusual geological difficulties, it may be claimed, without much fear of contradiction, that no portion of the State has received a more thorough investigation. My report is nearly ready for publication, and will be placed in the hands of the State printer as soon as he is through with the work for the constitutional convention, which at present is claiming his entire attention. This unexpected delay in the publication of the full report, makes it desirable that at least a digest of its contents be published in advance. Indeed the numerous inquiries which have been made during the last two months, make such a publication not only desirable but necessary, if I would not put more time on individual answers than I can spare. I have, therefore concluded to write you a fairly full and perfectly unprejudiced and conservative account of my work in Crittenden. to make these more available I have prepared the accompanying man, drawn to the scale of one inch--three miles, and showing, I believe, in as clear a manner as possible on so small a scale, the outlines of the county, the watercourses, roads, the location of the towns, post offices, principal churches and other well known points; besides, the outlines of the different geological formations, the courses of the veins and fractures of the strata and location of mineral deposits of various kinds. It may take some time to decipher all these features, but if you will print it properly, I have no doubt that most every one will succeed in doing so. The topography of the county, taken as a whole, is decidedly hilly. Much of this unevenness is the result of an unusually extensive system of fracturing, which this portion of Kentucky has been subjected to. Many interesting problems are connected with these convulsive movements of the earth's crust, which so frequently result in marked topographical peculiarities and in this region generally affect, if they are not the controlling factors of the line of drainage. These movements have further been of consequence to Crittenden in this that to them she owes her mettalliferous veins. Denudation and the leveling influences of time have wrought great changes since the shake up era. Indeed, cases might be pointed out where the present topography is quite the opposite of what it must have been immediately after that era; but, as the object of this communication is to show what is rather than what has been, their discussion would be out of place here. Except in the southern and north-western portions of the county, the hills consist almost uniformly of sandstone. In the excepted regions the "flint" or chert debris of the St. Louis limestone is the predominating rock. It is to the "flint hills" of these regions that the valuable limonite iron ores are restricted. Drainage is ample, as may be seen from the abundance of streams. Most of these flow into the Ohio river, which forms the northern boundry of the county. The Tradewater flows along the northeastern border, and the Cumberland forms about five miles of the southwestern boundary. The possession of facilities for cheap transportation, such as is afforded by these navigable rivers, is of the first importance in the development of the resources of any locality. Their value here can not be overestimated. GEOLOGICAL FORMATIONS, SOILS AND TIMBERS. The geologically lowest or oldest formation at the surface in the county is the St. Louis limestone of the subcarniferous system. The limestone itself is but rarely seen, and only at such points where the drainage is deep. It outcrops along the Cumberland river in the vicinity of Dycusburg and in the bed of Caney Fork at Tolu. The limestone is compact, silecious and of various shades of blue. The beds at Dycusburg are fine grained magnesian limestone, and would no doubt make good hydraulic cement. The regions of the county that are underlaid by this group of limestones (marked A on the map) are distinguished by an abundance of chert or flint blocks, which have remained as a residue after the disintegration of the limestone. The soil covering this chert debris is rarely deep, but very productive. Timber grows well and rapidly on it, and when sufficient care is exercised to prevent its washing, it maintains its rank as one of the best soils of the State for a long time. Resting on these cherty limestones there is another series of limestones, to which I have applied the name of Princeton group. They have a thickness in the county of about 200 feet, and the spaces where they are at the surface are marked "B" on the map. The lower 150 feet consists mainly of white oolitic limestones many of which would afford good building stone, while most of the beds could be turned into lime of superior quality. This portion of the group also furnishes the best soils of the county. These are practically inexhaustable, and in fertility are scarcely inferior to the far-famed "bluegrass" soils of central Kentucky. The regions where the Princeton limestones are the surface rock are not very extensive, yet they constitute a fair portion of the area of the county. Four of these regions deserve mention: The first and smallest is in the northwestern corner of the county, the second forms a triangular area southeast of Tolu, and both are margined on the north by broad strips of bottom lands; the third is the pretty Clements' valley; while the fourth is the northeast extension of the well known Salem valley, which extends into this county, from Livingston, as far as Levias. The formation next above the last is known to geologists as the Chester group. It consists in this county mainly of sandstones, the limestones and soft shales which are the prodominating constituents of the formation in other sections of the country, being but illy developed and in part totally absent here. Over about two-fifths of the area of the county, as may be seen by noting the distribution of the spaces marked "C" on the map, the Chester group of rocks are at the surface, and the total thickness of the strata referred to the formation is not less than 400 feet. Most of this large area is more or less hilly and supports a fine body of timber, with oaks predominating. Considerable tracts are, however, approximately level and well suited for farming purposes. The conglomerate sandstone, which is the lowest formation of the coal measures, rest on the Chester. this sandstone is coarse and generally contains small pebbles of white quartz. The region where it prevails (marked "D" on the map) are almost invariably high ground. Pilot, Cedar, Hardin and other knobs, and the high hill on the west side of the Crittenden Springs valley are formed of this massive rock. The soil, as usual with conglomerate soils, is but illy adapted for ordinary agricultural purposes, but the timber, on the contrary, are not surpassed either in quality or quantity, by those of any other formation of the State. These high nobs[knobs] are also without doubt eminently suited for fruit culture. Indeed, Crittenden county has natural advantages in that respect that are perhaps equal to any in the country. It is a feature that deserves to be remembered in the future development of the county. In the region marked "E" the lower coal measures are at the surface. These are mainly of importance because of the excellent beds of coal they contain. They will be discussed in a succeeding section. The soil is generally above average, while the timber growth is nearly as luxuriant and good as that of the conglomerate described in the preceding paragraph. The spaces marked "F" represent bottom lands. These occur mainly along the Ohio river from Fords Ferry west. The great and inexhaustable fertility of such lands is so well known that anything beyond their mere mention is quite superfluous. considerable tracts of such bottom lands also occur in the valley of the Tradewater. BUILDING STONE, LIME, CLAY, ETC. Building stone of good quality and varieties occurs abundantly throughout the county. The Princeton limestone, especially in the Clements valley near Bethel church, could be made to furnish unlimited quantities of oolite limestone, nearly all of which could be burned into lime of extra quality. Some of the beds would furnish also large size block of this stone, which is so deservedly esteemed as a building rock. the hydraulic limestone on the Cumberland at Dycusburg and other points along the river has been mentioned already. As near as can be determined from analysis, this rock should make a good quality of hydraulic cement. Sandstone suitable for ordinary building purposes is present in plenty. Flagging of unusual hardness and remarkable even surface is found in great quantity in the hills east of Crayneville. Massive beds of light colored sandstone also occur there. Many of these sandstones are almost pure quartz, and have been used with success as furnace linings. Many points in the county might be mentioned where good building stone, both of lime and sandstone, might be quarried, but lack of space forbids. Brick clays of good quality are abundant in the regions where the Princeton limestone is at the surface. One bed in particular deserves mention. This is exposed in the roadsides a short distance north of New Salem church. Its natural light red color changes to a brownish red when the clay is burned. The brick manufactured from this clay would have a more desirable color than any other known to me from Western Kentucky. Common red pottery ware could also be made of it, and it would serve very well as a cheap pigment. A large bed of umber and yellow ochres of very fine quality occurs on the land of Mr. T. T. Murphy, situated about five and one half miles southwest of Marion. With better facilities for transportation this deposit can not fail to remunerate investment. The bed is between six and eight feet thick, and has been traced over an area of at least eight acres. Other cheap pigments could be manufactured from the soft Chester shales which are exposed at several points in the county. I will mention only two beds which have been sampled and tested with satisfactory results. The first is an eight food bed of very soft green and purplish shales occurring on a level with the O. V. R. R. beneath the limestones of Giles quarry, about one and a half miles west of Nunn's station. The other is from an even thicker bed of shales on land belonging to Mr. Wm. Wilson, situated about midway between Marion and Crittenden Springs, on the line of the proposed railroad. Only one bed of coal having a demonstrated value occurs in the county. This bed is however of such excellent quality that its importance as a factor in the development of the county is to be scarcely overestimated. Its general excellence as a fuel had long ago been recognized. Before the decadence of the steamboat traffic the Tradewater coals, as they were called, were esteemed above all others by river men for steam making qualities. Before the war the Bells, Caseys, and other mines were worked vigorously. Even now, when the principal demand for the output of these mines has practically ceased, limited operations are maintained at some of them. This is possibly only because of the premium they command over competing coals, otherwise it would not pay the miners to haul their product sixteen miles to Marion over very rough roads. But the principal value and feature of this coal lies in its coking qualities, and in this it fills a want that is being more strongly felt every year. As will be seen later on, the coke made from the Tradewater coals appears to compare favorably in every essential feature with the best cokes of the country. And the value of this fact in the development of the county's iron and other metal deposits can not be overestimated. The coal seam is one of the lowest in the series of true coals. It outcrops at a number of points along Tradewater, from the mouth of that stream to Blackford, where the line of outcrop crosses over into Webster. Only two mines are in operation in the county, Barnaby's ("Kit and Jacks") and Tates, but evidences of former activity are to be seen at Lambs, Caseys, Bells, Spihards, Miners shaft Cooks, and Nunns or Sneeds mines. Across the river in Webster the Crab Orchard mines, which I regard as the same bed, are fairly active. The average thickness of the seam as noted at all these points is about four feet, with the extremes of variation three feet six inches and five feet. The roof, wherever I have seen it, is excellent, consisting generally of shaly sandstones. At limited points in the mines there may be a few inches of black slate or shales, or of softer gray shales between these and the coal. At the top of the coal there is almost invariably a thin layer, several inches, of coal that is usually termed a cannel, but its composition, as determined by Dr. Peter the chemist to the survey, is such that it scarcely deserves that denomination. This cap and the several inches of rash coal at the bottom are among the chief characteristics of this bed of coal. The main part of the bed, varying between three and four feet thick, consists of a very black and a very pure, soft bituminous coal, closely resembling the best Pittsburg varieties, in its external appearance; there is some filrous coal between the laminae and some pyrites. Analysis of the coal from several localities shows that it cokes well, with the coke of moderate density, and averaging over sixty per cent. Several barrels of coke produced by very rude methods at the Barnaby mines, certainly look like good coke, and Mr. McAlfatric, of Princeton, Ky., one of the owners of the Crab Orchard mines in Webster assured me that the coal from that mine produces a coke regarded by Pittsburg experts as in every way equal to the best Connellsville. Composition, dried at 212 °F. Those conversant with these matters will see at once that these coals compare very favorably with Youghigheny coal, which is so deservedly esteemed by the blacksmiths and for gas and coke. They are clearly better than any of the other coals used in Western Kentucky. But, as has been stated already, the most important advantages lies in their coking capacity, a feature that at no distant day must make them almost indispensable to the reviving iron and kindred industries of Crittenden and adjacent counties. Iron ores of several varieties occur at many points in the county, but only those occurring in that flinty debris of the St. Louis limestone north and west of Dycusburg and those in the same association in the region between Sheridan P. O. and Hurricane furnace, are likely to have a permanent value. These, therefore, alone deserve mention here. These two regions contain iron ores not only of first-class quality but in large quantities as well. The last fact is, of course, of prime importance. These ores are limones orit brown ores, and both in association and quality, are precisely like those of Western Tennessee and the region of Western Kentucky, commonly denominated as "between the rivers." The iron which is produced from these ores maintains an excellent reputation for strength and malleability: The Kentucky ore banks, though very actively worked before the war, have not produced much iron since. In the last few years, however, a desire to resume operations has become manifest. Several new furnaces have been build or are under way, and the revival of interest in the iron deposits is making itself felt throughout western Kentucky. 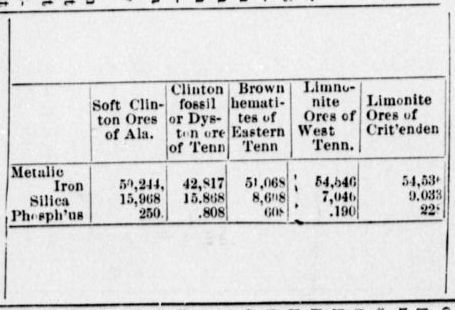 but Crittenden county, despite the fact that she had formerly demonstrated that her iron deposits are both good and reliable, seems slow in availing herself of the opportunity of "riding with the tide." Thus, while adjoining counties are pushing their properties into the foreground, little or nothing has been done here. Crittenden furnace, located near Dycusburg, began running in 1849 and continued in blast till the loss of slave labor during the war, caused the owners to shut down. For similar causes the Hurricane furnace, which was in blast during the latter half of that period, discontinued operations. Complete sets of the ores used at these furnaces were analyzed by Dr. Robert Peter, and published in Vol. 4 of the old series of geological reports of the state (1861.) I have take the trouble to work out the averege[average] composition of the ores as brought out in these analysis [analyses], and, although one of the samples was unusually poor and contained a much larger per cent phosphorus than usual, the result is so favorable that it may without fear be submitted for comparison with average analyses of the principal ores of Tennessee and Alabama. It should be mentioned, perhaps, that without the poor sample mentioned, the average of phosphorus is 0.190 per cent. Comparing the above analyses we find that in the matter of metallic iron the Crittenden ores almost head the list, while the phosphorus, which as explained above should really be no more that 0.2 per cent, is considerably lower than in the Clinton ores or [of] both Alabama and Tennessee. As usual these limonite ores occur exclusively in "pockets." These are numerous but vary greatly in extent, a few appearing practically ine[x]haus[t]ible, while many may not contain over a thousand tons of ore. In the Hurricane district the deposits are mostly of the smaller sort, but being very abundant the aggregate supply is very large and, no doubt sufficient to satisfy the demands of a furnace for many years. In the Dycusburg district some of the deposites [deposits] are unquestionably very large. The majority are situated from one to two miles north of Dycusburg, on each side of Paddy's creek. A large hill on the south side of the creek near the river (owned by Dr. W. W. Graves, and Messrs. Heywood and Marshall) must contain an immense quantity of "honeycomb" and "pot" ore--mainly the latter. Going up the creek I examined the ore banks chiefly depended on by the old furnace company. These are not exhausted by any means; great quantities of good ores, principally of the "honey comb" variety, being still in sight. Another body of fine ore occures [occurs] on Dr. Graves' land on and one-half mile east of the burg. I have information besides of other bodies in this vicinity which I did not find time to visit. Enough was seen however to convince me that this district could insure a steady supply of ore to a large furnace for at least fifty years. It may be stated with [no fear of] contradiction that Crittenden county contains more deposits of lead, zinc, flour [fluor] spar and barite than other section of the State. Most of these have been known for many years and only a few are to be regarded as recent discoveries. None of them, excepting perhaps the Columbia mines, have ever been worked with even a semblance of mining capital to back them. Of course many shafts were sunk where there was absolutely no chance for success. Nor are the usual stories of deposits of gold and silver wanting. Any well informed man must however know that gold is not found in this region. Nor need silver be looked for save as a very minute percent in the galena. 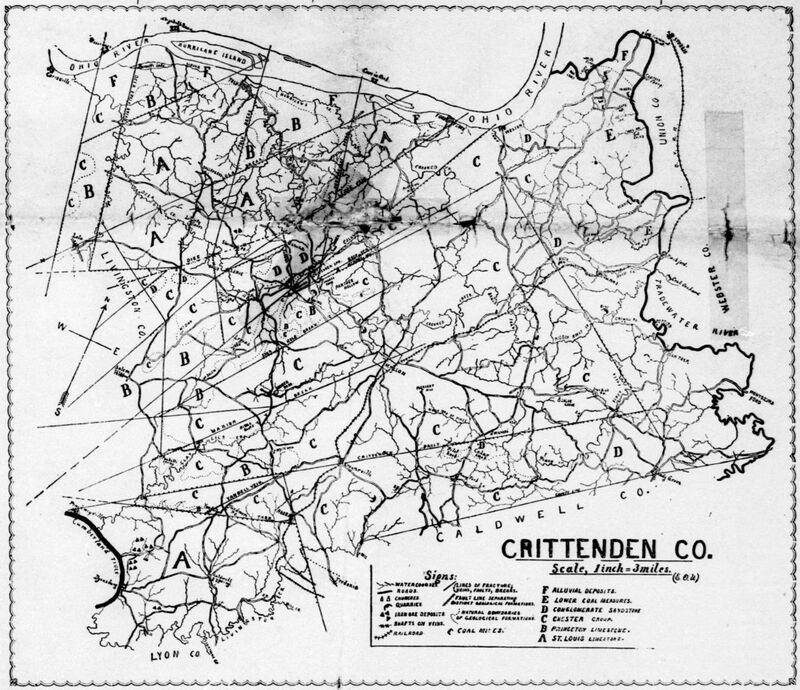 Still, Crittenden has many mineral deposits that ought to prove valuable. It has been claimed that the lead deposits of Crittenden are simply segregations filling cavities in the limestone. This claim scarcely deserves serious refutation, since but little geological knowledge is required to enable one to determine that the county is crossed by numerous faults, and that the lead deposits invariably occur in the line of the fractures. They are therefore in true fissure veins, the origin of which was in no way dependent upon shrinkage of the strata nor to the eroding or cavity-making effects of water upon the limestone. On the contrary these fissures are of deep seated origin, having resulted from convulsive movements of the earth's crust, whereby it was fractured and the country for some distance on one side of the dislocation either shoved up or thrown down. The down throw is [in] several instances in the county cannot have been much less than one thousand feet, and only in a few cases among the twenty or more "faults" that I have determines was it less than two hundred feet. The deep seated origin of these fissures was suspected already by the pioneer geologist, David Dale Owen, who was State geologist in the latter '50's. His comparison with the Devonshire lead deposits was nearer the truth than he knew. The comparison seemed to fail in one important point. In Devonshire, namely, the metalliferous fissures are associated with trap dikes, or rocks of igneous origin, and until lately nothing of that kind had been known here. My investigations, however, have developed the fact that such dikes do occur in Crittenden county. A point of one of these where a shaft nearly fifty feet deep has been sunk, is locally well-known as the "Flanary silver mine." Much scientific interest attaches to this discovery, but beyond the mere determination of the existence of igneous rocks in this field, they have no economic value. In my report to the survey I discussed, at length, the questions related to the source of the lead and other minerals in these veins, the horizons at which the greatest deposits may be expected and the depth to which they extend. It is neither necessary nor desirable to go over all that here. A mere statement of my conclusions will suffice. Source: Crittenden Press. (Marion, Ky.) 1879-1907, August 16, 1894, Image 5 - Chronicling America - The Library of Congress.